This month’s book review is a little break from the norm. 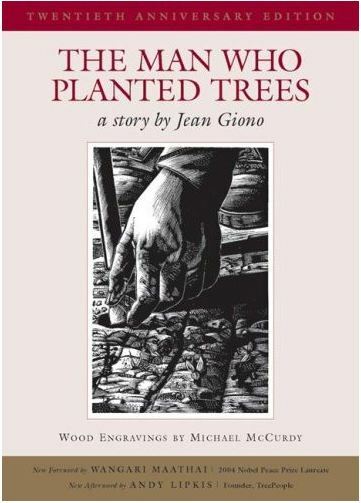 The Man Who Planted Trees is a work of fiction. And there is no sub-title of, “… and then he used the lumber to make…” It isn’t a book about building tables or chairs or boxes. It isn’t the final word in cutting dovetails, or even a comparison of dovetail cutting techniques. And there isn’t one mention of any kind of hand tool, other than an iron rod about four and a half feet long. Instead, it is a story about reflection, hope, and power. It is an illustration of how just one person can make a difference. It is an allegory about preserving and renewing the natural resource we all love to touch and smell and work with, long before it is cut into lumber. The hardbound copy I have is the 20th Anniversary Edition, printed in 2005. It is illustrated by Michael McCurdy with some amazing wood engravings. If you chose to read this book, please don’t forget to spend some time looking at them – the detail and design is fantastic. I’m not sure about other editions, but this one is printed on 100% recycled paper and has a stitched binding. The story is narrated by a man who first meets a shepherd in a barren land in Provence, France, in 1910. That night, the man watches his host sort out acorns. The next day, as they walk along a hillside, the shepherd uses an iron rod to make holes and plants 100 oak trees. He had been planting trees like this for the last three years and his count was up to one hundred thousand by that time. Of those, twenty thousand had sprouted and he expected to lose half of them to the processes of nature. But that left him with ten thousand oak trees growing where nothing had been before. Our narrator returns to the barren land periodically to check up on the shepherd. He finds the old man has continued planting trees – birch and beech, this time – and comments on the changes the forest has brought to the land. Creeks once again flowed with clear, clean water. Hunters occasionally strolled the wooded area, looking for hare and wild boar. Mother Nature helped out with her own plantings of flowers, undergrowth, and meadows ; all she needed was a place to start. And, finally, he returns to find a thriving community – a village of 28 inhabitants, new houses and farms, and fields of barley and rye. This is a work of fiction. But it is based in fact, as is evidenced by the foreword from Nobel Peace Prize laureate Wangari Maathai and the afterword from Andy Lipkis, founder of TreePeople. The idea of planting a forest to revitalize a community – to bring water back to dry wells and streams, to renew depleted soil, to restore the natural environment – is something we should always carry with us in the back of our minds. With that, we should remember that we, as individuals, can make such a change happen. Read the book the first time through for the enjoyment of the story. Read it through a second time to take in the wonderful wood engravings. And as you read through it a third time, start asking yourself what you can do in your life to facilitate such a change on our planet, whether it is planting your own forest or making a contribution to one of the many forestation projects and organizations out there. Not sure what you can do? Fret not, fellow woodworkers – there is a section in the back of the book (page 55) that helps you get started. It is also possible to read just the story on-line, if you so chose. You can find it here. But you miss out on all of those wonderful wood engravings and the additional information in the back. The animated short film by Frederic Back, based on this story, is a delight as well. I’ll have to check that out, Jim! Thanks for the additional information!